The Lexington-Fayette County Health Department had a successful day last Saturday at Lexington’s annual Pride Festival. The Targeted Prevention team, in partnership with AIDS Volunteers of Lexington (AVOL) tested 36 people for HIV, passed out 2,220 condoms and provided 17 bleach kits. John Moses, Aaron Mosley, Theresa Lakin, Julie Moon and Sierra Dantzler worked the event for Targeted Prevention. Our CHEE team also held about 40 diabetes risk tests, which identified 22 people as being at risk for diabetes. From there, they identified two people with pre-diabetes and two who were in the diabetes range. The team will follow up with those people in the next few weeks to see if they contacted a health care provider. If not, our employees will try to direct them to one. Carol Hisle, Tara Mason, Ruben Perez, Nancy Hiner, Melissa Smith, Drew Ritzel (student) and Melissa Dickey (Passport) worked the event for CHEE. 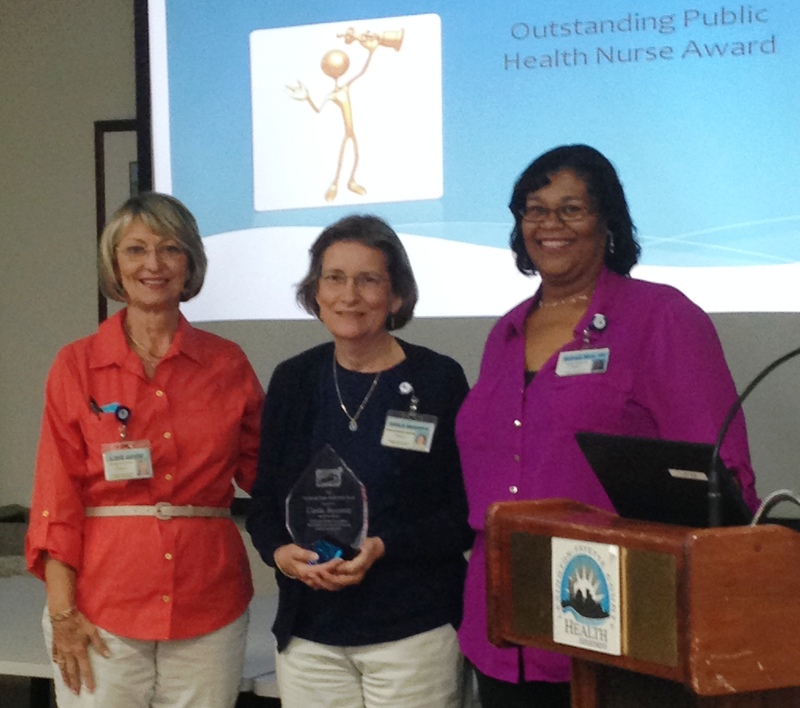 A Lexington nurse recently received the Outstanding Public Health Nurse Award given each year by the Kentucky Public Health Association. It is given annually to honor an outstanding nurse in Kentucky, and the nominations should reflect extraordinary work. Carla Basanta, who has been with the Lexington-Fayette County Health Department for 22 years, was singled out by her peers for her involvement with the public health clinic, immunizations, well child exams, family planning and direct nursing care. The nominations also highlighted her more recent work developing and maintaining a Quality Assurance program for the health department, as well as organizing annual community flu shot events at senior residential centers. One of the questions submitted to the officers for today’s all-staff meeting was about the possibility of viewing a PBS Frontline segment about the Ebola virus. The officers decided watching a segment of this length would eat up too much of the time in the staff meeting, but we wanted to make sure it was available for anyone interested in viewing it. You can check it out here: Ebola Outbreak. LFCHD has two different recycling streams: “dry” paper/cardboard and “wet” beverage/food containers. This helps to keep the “dry” things clean and dry, and helps reduce the chances of bugs and odors throughout our buildings. Smaller blue recycling bins are in most break areas. • Empty, rinse and recap plastic bottles before placing in blue recycling bins. “Err” on the side of cleanliness. • Empty and rinse aluminum or steel cans and glass containers before placing in blue recycling bins. • Only office paper products, newspaper, magazines and cardboard in grey bins or big blue office “Rosie” containers. Note: These guidelines may be different from home recycling. If you have any questions about recycling, please contact Tara Mason or Doraine Bailey. Please take a moment to welcome the newest employees of the Lexington-Fayette County Health Department.